Vänersborgs Konstgrafiska Verkstad is an association concerned with the running of an artists collective workshop for printmaking. It started in 1982 in one of the oldest wooden buildings in Vänersborg under the direction of the printmaker Göte Sällström. The number of members has increased over the years and there has been a successive acquisition of further equipment. In 1996, the workshop moved to Edsgatan 5, in the centre of Vänersborg, renting premises from Vänersborg’s town council. The advantage of a small collective workshop is that individual responsibility and participation is greater which allows every member to make a contribution to the various activities involved in running a workshop. To become a member it requires that each person has sufficient experience to be able to use the equipment without guidance. The external activities include exhibitions at various localities in Sweden, open-house days in connection with local cultural events as well as participation within various other cultural contexts. 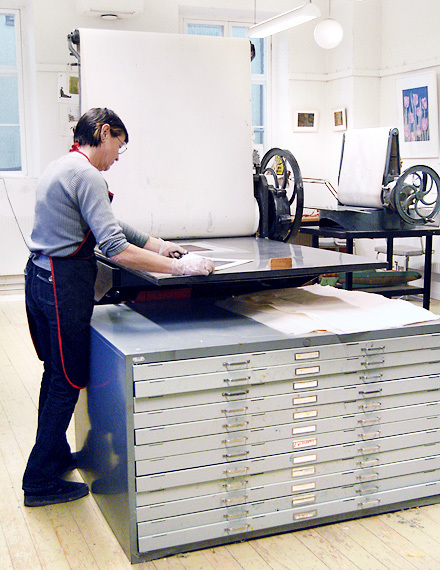 Our aim is to develop our own activities as well as to highlight and promote printmaking as an art form. At present the association has ca 40 members.